Heat your grill on its medium setting or prepare charcoals for cooking. Place the burger patties on direct heat on the grill and cook to desired doneness, flipping once. Spoon pizza sauce onto the burger patties and then top with diced tomatoes. Place a slice of mozzarella onto each burger. Close the grill lid and cook for 2-3 minutes until the mozzarella is softened. Pile basil onto each of the hamburger buns. Top each with a loaded burger. Cover with the bun top. These aren’t your ordinary burgers. They’re unexpected and exciting. Something special for a backyard barbecue or Sunday dinner. When you serve them, they draw a ‘Wow.’ Good stuff! Take one juicy beef burger and cook it to your favorite doneness, then add the toppings for one delicious Margherita Pizza. The result? An amazing burger that’s part pizza, part summer classic. 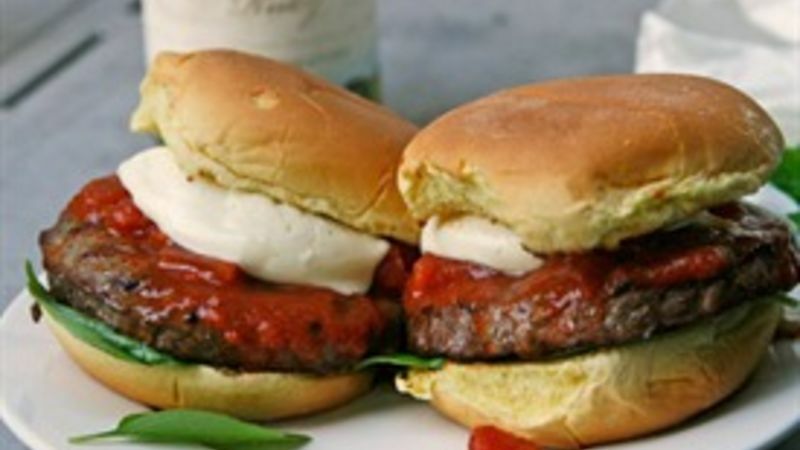 And don’t worry…this Margherita Pizza Burger recipe is easy to make too. Easy is good! I made these with Muir Glen’s special 2011 Reserve Tomatoes and Muir Glen Pizza Sauce. The Reserve Tomatoes are sweet bits of amazing freshness – the freshest tomatoes I have ever gotten out of a can. A-mazing. I highly recommend them. But if for some reason you don’t use them, you can also use Muir Glen’s No-Salt Diced Tomatoes. Use fresh mozzarella on these. It softens nicely in the heat in just a few minutes and adds nice fresh dairy flavor. Oh, and a pile of basil. Yes, a pile! It ended up being the favorite part of this burger when I served it. Sarah W. Caron (aka scaron) is a food writer, editor and blogger that writes about family-friendly foods and raising a healthy family at Sarah’s Cucina Bella.